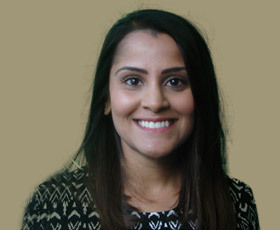 After completing a Bsc in Biomedical Sciences in 2003 Arati went on to graduate from Queen Mary, University of London Dental School in 2011 with honours and several prizes for academic and clinical excellence. She has a keen interest in continuing professional development and post-graduate learning. She has completed part one of her Royal college of surgeons examination and is currently undertaking an Msc in Restorative dentistry from the highly regarded Eastman Dental Institute University College London. This course has further raised the high standards of her general dental care and has given her valuable experience in dealing with more complex dental-treatments-croydon. Arati enjoys all aspects of general dentistry, particularly restorative and cosmetic dentistry including teeth alignment. She is trained to provide a number of cosmetic procedures including Enlighten dental whitening, C-Fast braces and Inman Aligner. She is committed to providing each patient with high quality care and has a friendly approach to ensure patients are put at ease during treatment. She understands dental treatment can be a difficult experience for most, so will always strive to make patients feel comfortable and well informed. In her free time Arati enjoys spending time with her friends and family, cooking and travelling abroad.